You are here: Home / News / TEDxDelft 2013 / TEDxDelft 2013 | First TEDxDelftCinema a hit! TEDxDelft 2013 | First TEDxDelftCinema a hit! 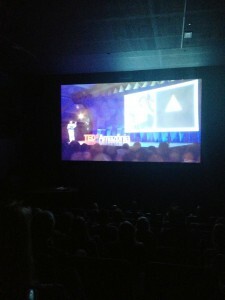 The first edition of a series TEDxDelftCinema evenings in Filmhuis Lumen was a big success. In front of a diverse group of movie-lovers, TEDfans, friends and family, Pieter Guldemond shared in a very moving way personal stories, talked about his family, his life, his personal beliefs and how he deals with being in the spotlights while also maintaining a (busy) social life. Filmhuis Lumen has a special place in his heart as it is a place where he can truly and completely relax. Once the lights go off he forgets about everything for a while, those are rare moments in his hectic life. He showed a talk by Bjarke Ingels. The contrast in this talk was interesting. Crazy inspiring creative ideas on the one hand, while presenting on the other hand also a megalomanic idea in Baku. He talked about his love for the music by Spinvins at TEDxDelft last year. Spinvis could not do his talk due to personal circumstances. Still, his music told just as much about getting lost as a destination and using your intuition, as the TEDxDelft talk he had planned to do. He showed the movie by Lesley Hazleton, that doubt is essential to faith. For Pieter it stands for being able to show doubt, in a time where politicians only win by presenting populist ideas in firm one-liners. Last but not least, he surprised many by the knowledge that you should NOT tell your personal goals, as you are less likely to really reach them. How this actually works in your mind is told by Derek Sivers. The icing on the cake of a fabulous night was the movie A Single Man. Pieter watched this movie several times, and every time the music, acting and struggle, so beautifully portrayed by Colin Firth, touches him in the heart. https://www.tedxdelft.nl/wp-content/uploads/2016/02/TEDxDelftLogoWebsite.jpg 0 0 EvelineVreede https://www.tedxdelft.nl/wp-content/uploads/2016/02/TEDxDelftLogoWebsite.jpg EvelineVreede2013-09-19 09:35:472015-08-01 06:11:30TEDxDelft 2013 | First TEDxDelftCinema a hit!